Seating Layout 6 guest per train, inline seating. Another Magic Kingdom ride is planned for refurbishment in April. As an icon of the Magic Kingdom, this ride packs twice the punch. You get two tracks that are the same, but mirrored (Alpha, right turns are left turns, Omega, left turns are right turns.). The bad thing is the wait. During peak times, wait times are over an hour, and Fast Passes are almost sold out. If you go first thing, wait times aren't that bad, only 15-25 minutes. After refurbishment (2009) made ride experiences better because you don't have to get squeezed, and getting squeezed stinks. This is a must. I absolutely love Space Mountain. You don't find these types of great roller coasters in almost any amusement park. I love the pace, the dark, and the queue line. They all make up what an awesome ride this really is. This is a MUST RIDE, It´s super cool and awesome. I like it very much, a classic Disney Roller Coaster. 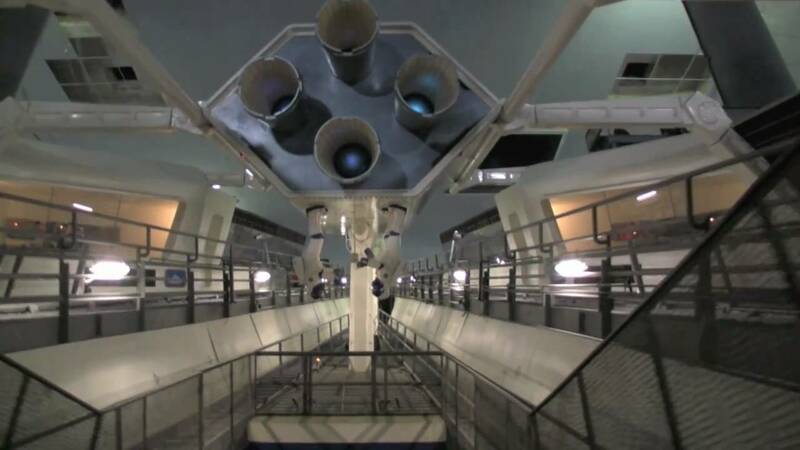 Space Mountain is a dual track, enclosed roller coaster ride, located in Tomorrowland at the Magic Kingdom. It underwent a major refurbishment in 2009, click here for details. Restrictions: Must be at least 44 inches tall to ride. 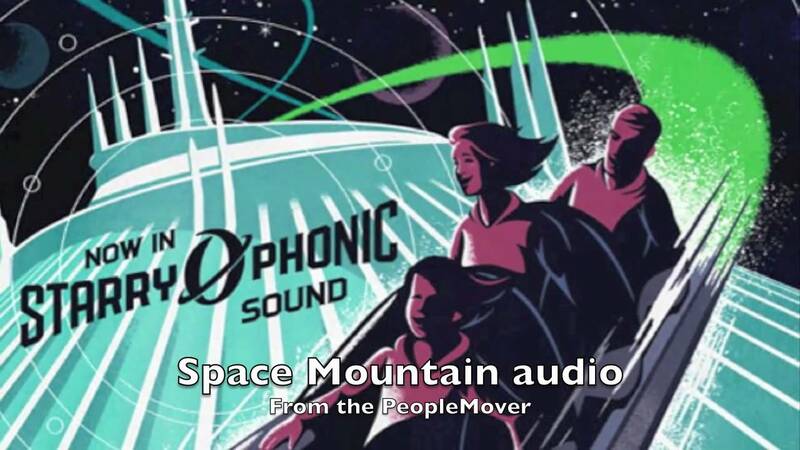 Since its opening in 1975, Space Mountain has thrilled millions of Magic Kingdom guests on a twisting and plunging "space journey." The popular Walt Disney World Attraction, presented by Federal Express, provides guests with high excitement and delights them with imaginative scenery from the world of space. PRE-LAUNCH: Entering Space Mountain, windows appear to look out into the universe, providing a sensation of walking through space and the anticipation of a spine-tingling adventure -- a dark ride through space. BLASTOFF: Guests board six-passenger trains that rocket through tunnels of flickering neon lights, then begin a rapid descent along an intricate and dark track. The spatial-effects lighting, sprinkling the inner-heavens with galaxies of stars, darting meteors and glowing space vehicles, sets the stage for an adventure as close to a cosmic voyage as most people will ever experience. 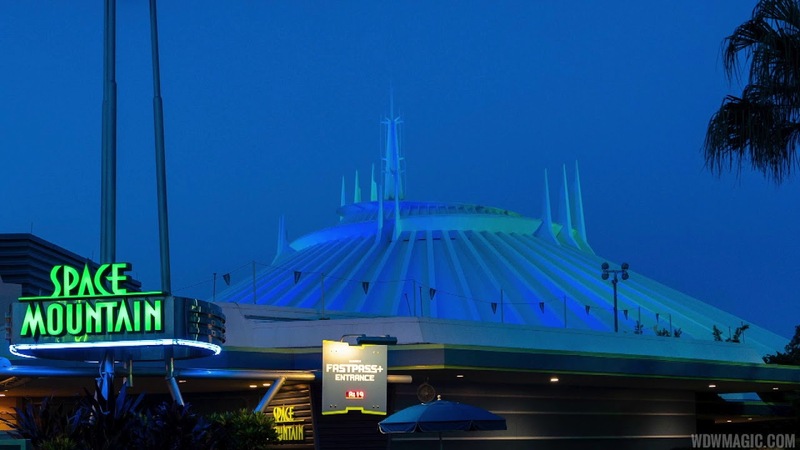 HISTORY: Space Mountain originated in the early 1960's when Walt Disney conceived the idea of a high-speed thrill attraction based on the imaginative thrust and excitement of the Space Age. BY THE NUMBERS: Rising to a sloping, cone-shaped peak 183 feet above ground level, Space Mountain contains 4,508,500 cubic feet -- capable of holding a small skyscraper in its interior. 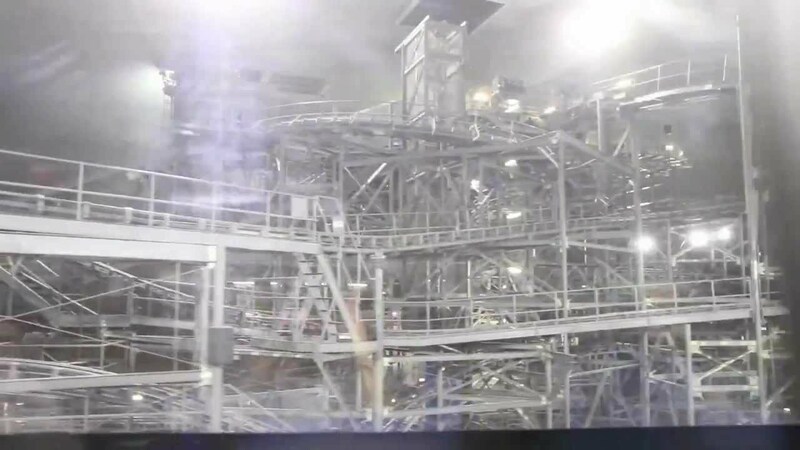 The adventure has a base diameter of 300 feet and took two years to build. In basic structure, the mountain is composed of great ribbed slopes -- 72 massive pre-stressed concrete beams forming a gigantic sealed cone. Each of the 74-ton concrete beams was cast near the Space Mountain site and then hoisted into place by mammoth cranes to complete the cone. Each beam is 117 feet long and is 13 feet wide at the bottom and 4 feet wide at the top. Guests are amazed that the maximum speed is 28 mph, because the attraction delivers high-speed thrills.